You may get a lot of questions about the quality and features of the Iphone KA08. Most people are intrigued by it when they see photos of it because: it's smaller; it has dual sim slots; it has all of the major features of the original; and it doesn't require any long term or expensive carriers or plans. However, sometimes there are doubts or hesitation as to whether this phone is really of a decent quality or whether it really works well. So, in the following, I'll offer my review of iphone KA08. The KA08 Is A Cute Mini Phone that is full of features: I think the main thing that draws people's attention to this phone, at least initially, is the small size. Honestly, this is a pretty cute phone. And, it comes in tons of color options including pink, red, blue, green and yellow, as well as your basic blacks, reds, whites, and metallic. A lot of people like that it's no larger than a credit card and that it easily fits in your pocket without poking out or without rubbing up and down your upper leg the way that some of the larger touch screen phones do. So, in terms of appearance and the cuteness factor, it gets an A plus. Now, concerning the features. Iphone KA08 is considered pretty loaded. It is a quad band. It does have to dual sim slots. It does support Bluetooth and it has media players (music and video) as well as FM radio, web browsing, email, texting, and a digital camera with video recording. It also has one cool bonus feature that you're either going to use a lot of you're not going to use at all - talking text. This means if you get a text and you're too rushed or you're driving and you don't want to have to look down to read your text, the phone will read it to you. It can also accommodate up to 8GB of memory. If there is one thing missing from this phone, it's Java. Some people find that to be no big deal, considering all of the other things that it offers, but some really like the productivity applications that one can download via Java. How easy is the iphone KA08 To Use? Is it of a decent quality? 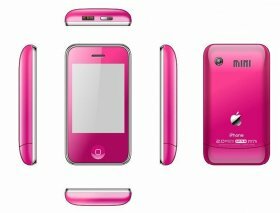 If you've ever used or seen a iphone KA08, then I can tell you that this one is fairly typical and that this is a good thing. It has a pretty responsive, high definition touch screen that makes using it pretty fast. The menu and welcome screens are pretty intuitive and the sound quality on both calls and music / video is quite good. The phone is sort of known for their speakers and this one doesn't disappoint. Web browsing is pretty decent and quick too. The camera takes good enough pictures. And the phone feels quite solid and respectable to me. I'm often asked how hard it is to text on this small phone. It's not too bad, especially if you have smaller hands. But if you're hands are large, there is a stylus that will make this quicker and easier. So, iphone KA08 does have all of the bells and whistles and for the most part, the quality is there. Price wise, this one is usually under $100 and that only tells part of the story because the savings continue over the life of the phone. You aren't bound to any one carrier with iphone KA08. These phones can use any GSM sim card, including pre paid or pay as you go. If you're using a pre paid all in one card (Internet, talk, text, etc. ), you can often do everything that you need to do on your cell phone for just over $20 per month. This makes this phone very attractive to a lot of people. If you are looking for iphone KA08, online marketplace should be on the top of your list. After all, it's really cheaper while with competitive quality. What's more IPhone I9B is on hot sale on online marketplace now. Give yourself another choice. Here one news from online marketplace is that if you buy iphone KA08 on Topons which features Wholesale Electronics, then you get $10 coupon, and the coupon code is ACD8J.